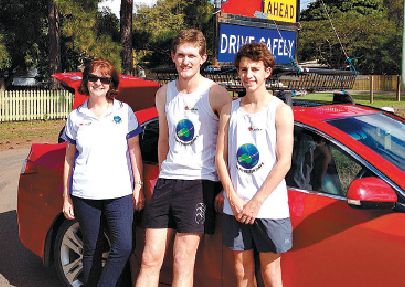 Caritas care: Run to Better Days support driver Glynis Mayer stops to talk with two of the relay runners Cosmo Dove, left, and Matt Paltridge on the road between Hervey Bay and Maryborough. Twenty-two runners covering more than 1400 kilometres over 15 days, talking to some 10,000 students and raising more than $12,500 for Caritas. These are the figures which have left proud smiles on the faces of a group of young people who took part in the recent Run to Better Days relay event down the Queensland coast. The runners, 11 of them medical students from James Cook University Townsville, started their journey in Mackay on July 5 and finished at Marymount College on the Gold Coast on July 18. Event co-ordinator and runner, Daniel Charles said the relay, in its fifth year, “had been inspired by the plight of hundreds of millions of people worldwide who still go hungry, and don’t have access to safe drinking water or basic healthcare”. On the run he spoke to an assembly at his old school Xavier Catholic College, Hervey Bay. Caritas regional engagement co-ordinator Joe Foley also spoke to the assembly. The Run To Better Days crew hailed from across Australia, including Brisbane, Hervey Bay, Gladstone, Mackay, Ayr and Melbourne. The team gave more than 50 presentations along the way at schools, community organisations and universities on what Australian can do to help end global poverty. Mr Charles said the relay “also aimed to rally support to encourage the Federal Government to increase the amount and efficacy of assistance Australia provides to developing nations”.